Slather bread slices with the pesto. 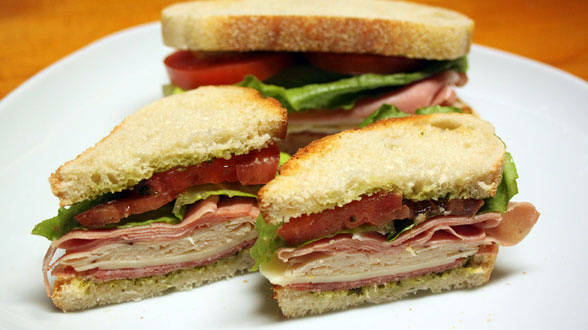 Build your sammie by placing a couple slices each of salami, provolone, turkey and mortadella. Top with lettuce leaves, sliced tomato and another slice of bread. Cut diagonally across sandwich to make 2 triangles. In Recipes-list.com we have selected the most viewed recipes from category - uncategorized . Enjoy the best recipes specially selected for you! Italian Sandwich is the right choice that will satisfy all your claims.